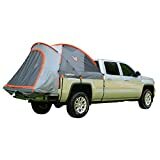 Looking for the Best Truck Tent? Our recommendation as the best truck tent is the Kodiak Canvas Truck Bed Tent. For one thing, it is seen as a four-season, year-round tent. It offers excellent insulation for use in colder weather. Despite having five windows plus a cab access window its ventilation in warmer weather could do with a little improvement. The tent holds up well to frequent use thanks to the thick canvas fabric as well as the steel frame. Though it may take some time to learn how to set it up, once you get the hang of it, it is straightforward enough to set up by yourself. Overall, the Kodiak Canvas Truck Bed Tent is a hardy tent that'll see you through season after season. To make your search for the right truck tent easier, we came up with detailed reviews of the top five truck tents on the market. We also created a thorough guide about pickup tents, explaining essential features to consider before you buy to ensure you get the right product. By the end of our article, you'll be able to choose the best truck tent so that you have an enjoyable experience camping in a pickup truck bed. Unlike standard camping when you focus on size according to how many people you're bringing along, with a truck tent, you must first be sure it's the appropriate size and design for your vehicle. Just because a tent says it's intended for a pickup truck, that doesn't exactly mean it's for your particular truck. Some are a one-size-fits-all situation, but others may be more specific. It's a simple process though to determine if the tent you have in mind will fit. You'll have to measure your truck bed, a process you can find assistance with online if needed. If that doesn't yield the results you're looking for, contact the manufacturer of the tent with your vehicle information and ask if it'll fit. Although your truck bed can limit the length and width of your truck tent, the same isn't always said for the height. Truck tents can have various heights, with some being tall enough to allow many people to stand without having to crouch. Smaller tents, however, tend to be more light in weight and easier to use. If you're expecting more people inside the tent, then you may want to opt for a larger tent. They can be a bit heavier and may require more than one person to set up. However, they do offer greater mobility inside. Just like with all tents, it may not be fun to spend an hour or longer trying to set it up. When you get to your campsite, you probably want to pitch it and start enjoying yourself. So, it's in your interest to find a tent that you can understand and setup with ease. The majority of truck tents already come with a simple set up system to make the process more manageable though. There is a reason importance is placed on mesh windows and the overall ventilation system when it comes to tents. Without proper air circulation, things can become stuffy and uncomfortable. When deciding on the right truck tent, it helps to take a look at the ventilation system and make sure it does an excellent job at pushing out hot air. Not all truck tents are made the same according to what weather they perform best in. Some have exceptional ventilation systems that perform well in hot weather. Others may have a good ventilation system while still having good insulation to make it warm in cold weather but not overwhelming. The ones with such good ventilation are generally three-season tents that work best during seasons such as spring, summer, and early fall. For the tents that have better insulation on top of adequate ventilation so that it doesn't get too hot, these are the all-season, year-round tents. You can best decide which one will suit your needs by checking the weather of your campsite early in advance. Another aspect to focus on is wind protection. Regardless of which season you're camping in, moderate to heavy winds can still strike. You'll want your tent to hold firm against any wind so that it doesn't collapse or fly off your truck. A reinforced design can ensure that your tent stays strong. Also, having waterproof capabilities is another benefit. Just like wind, rain can hit almost any time (or, in colder weather, snow). If so, the tent's fabric should have water-repellant features such as heat sealed seams. There should also be a quality rainfly to be the first defense against a bout of rainfall. There are some other features you can consider when buying pickup bed tents. Some models are designed with a built-in floor so that you're not sleeping on your truck bed. This not only protects the truck floor, but it can also further enclose the tent so that you remain safe from the outside elements. If you're going to find one with a floor, then you must be sure that your truck bed is free of any other items. This is because the floor must lay flat to fit. If you know you'll have some other items in your truck, then perhaps it's best to forego the floor. Another feature to consider in truck tents are those designed with cab access if you have a cab window. With a spot for cab access, you can get inside the tent using the window also. This can be nice if you're looking for a tent with multiple accesses. This can also allow you easier access to the inside of your truck as you can reach in and grab other items, turn on the radio, etc. Lastly, think about storage options. There are many tents made with mesh storage pockets on the tent walls. These offer some additional room to put smaller items so that they don't get in the way of your larger gear. The Rightline Gear truck tent has a floorless design so that you can set it up without having to remove anything from your truck bed. This type of design also ensures that the tent doesn't pick up any debris that may be on the bed. It's roomy enough to allow for a plenty of space for two adults. 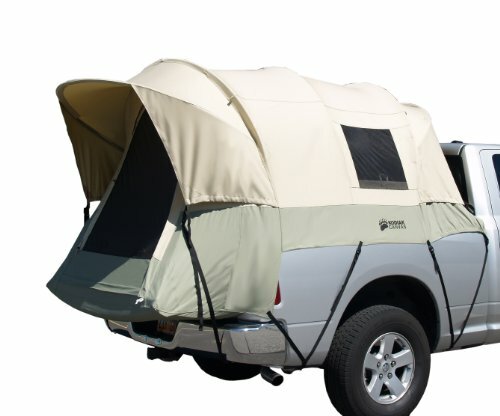 For setup, you can pitch this tent on your truck in less than 20 minutes, perhaps even faster if you've done it before. Much of this is helped with the color-coded poles and the pole pockets. It eliminates the guesswork in placing the poles. This way, you can worry less about setting it all up and focus more on having fun. It also includes a rainfly that you can apply if you wish. Connecting the rainfly is easy enough to do, which may benefit you if severe weather strikes unexpectedly. Speaking of bad weather, the fabric has good water-resistant capabilities in addition to tape sealed seams to leave you dry inside. Rightline Gear 110730 Truck Bed Tent is a simple to use tent for full-sized trucks, and it offers a floorless design so that you don't have to remove anything from the truck bed to set it up. With the Milliard Truck Tent, you can fit this on any standard pickup truck with a bed that measures 6.5'. This offers plenty of versatility in the type of vehicle this tent can be used in. This tent is designed with mesh ventilation screens on the door as well as the windows. The windows are also made with privacy closures. This may benefit individuals who seek a little bit of privacy while camping, an especially useful feature at night. 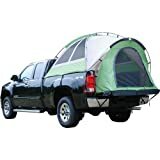 The tent does come designed with a sewn-in floor that fits with ease over your truck bed. This can provide you with a layer of comfort underneath your sleeping bag so that you rest easier. The tent also has storage pockets as well as a lantern hook to hang a light. Milliard Truck Tent is one of the best tents for those of you who are more casual with your truck camping, and it's simple enough to set it up in less than 10 minutes. 4 large windows and 1 door. Provides ample ventilation. Full rain fly. Capacity: 2. Use: 3 season. Tent/Rainfly Material: Polyester taffeta. Napier Backroadz Truck Tent is a standard truck tent that can fulfill your casual camping needs. Setting it up is simple if you know what you're doing thanks to the shock-corded fiberglass poles. They're light in weight as well so that they're easy to handle. These poles aren't the most ideal when it comes to strong winds though. It does offer some good protection against rain. You can attach the rainfly whenever you need it, and it covers well. In addition to that, the tent is made with a storm flap in the door for an extra layer of protection as well as providing you with some privacy. When it comes to the interior, there is a decent amount of room inside this tent for two people. It even has adequate headroom. Most can stand and still be comfortable when you do it. 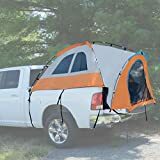 The Napier Backroadz Truck Tent may be the simplest of tents you can buy for your truck that's relatively easy to assemble and has a good storm flap to give you added protection against rain. Kodiak Canvas Truck Bed Tent is among the most durable of truck tents due to the use of canvas fabric. It's naturally thick and heavy-duty so that it can withstand hard use. The material is also waterproof, so it fights against rain well. It is a year-round tent, but it's not recommended to use it in heavy snowfall. This does well in heavy winds thanks to the sturdy steel tube frame. When it comes to space, this tent has a tunnel-like design to enhance the interior space height. It also has a tailgate down design. This is so that you can expand how much usable space you have with the tent. This comes with five windows to provide ventilation. However, it still does heat up rather well, which may be great for colder weather but poor for warmer months. In addition to those windows, there is also a cab access window so that you can reach into your truck whenever you need to. The Kodiak Canvas Truck Bed Tent is best used for heavy-duty, frequent camping year-round thanks to the quality, sturdy materials used. Sportz Truck Tent is capable of sleeping two people and still offering some space to move about and stand. It clears over 5.6' of headroom inside. This tent also has a rather large rear cab access window. This way, you can access your truck as well as providing you with additional storage since you can use the truck as well. If you're looking for ventilation, the tent comes with two mesh windows as well as side vents. Air circulation is good enough for use in warm and hot weather. It also has a large entrance door that you can open if you're looking for even more circulation. For fast setup, the tent utilizes a color-coded pole and sleeve system. When you set it up, there's extra protection for your truck thanks to the strap protectors. Once you're ready to go after you've enjoyed yourself with the tent, you can pack it all up in the accompanying carrying bag easily enough. The Sportz Truck Tent is a quality tent that provides great ventilation for use in warm weather as well as good water protection with the rainfly. A collapsible canopy can be useful for a larger groups sheltered cooking area. Without the pickup? Consider a easy pop up tent instead! If you are camping as a big group, then large cabin tents may be your ticket. Not sure which tent to get, start by seeing which tent brands you should trust. Consider buying a tent ceiling fan to help you stay cool this summer.